Greeneview quarterback Nick Clevenger hands off to Clay Payton in the pouring rain, Friday, Oct.12 at Cedarville High School. The Rams won the contest, 52-8. Cedarville running back Kane Odon (35) takes a pitchout from Indians quarterback Colby Cross, as Brandon Pollock heads around the left side as the lead blocker, in the first half of Friday’s Ohio Heritage Conference high school football game against visiting Greeneview. Greeneview’s Jon Brakeall (4) hits the first of his five extra-point conversions, Oct. 12, in a 52-8 win over host Cedarville. 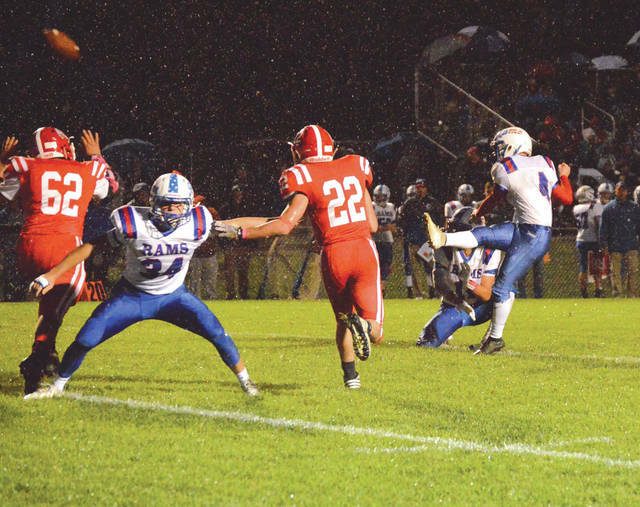 CEDARVILLE — On a rainy and cold, slippery night, the turnover bug bit the host Cedarville Indians. 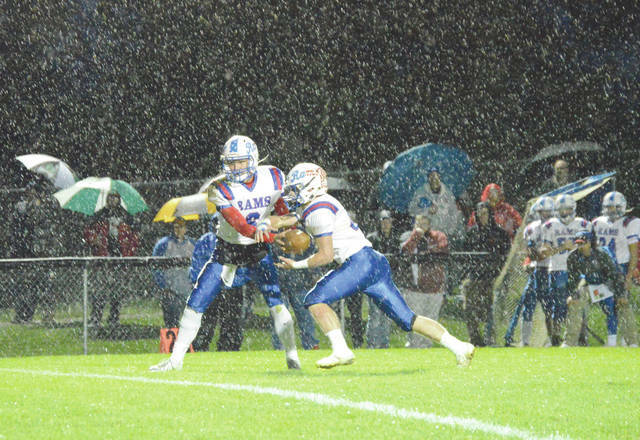 In the annual Battle of Route 72, visiting Greeneview rolled to a 52-8 win in front of a soggy near-capacity crowd. 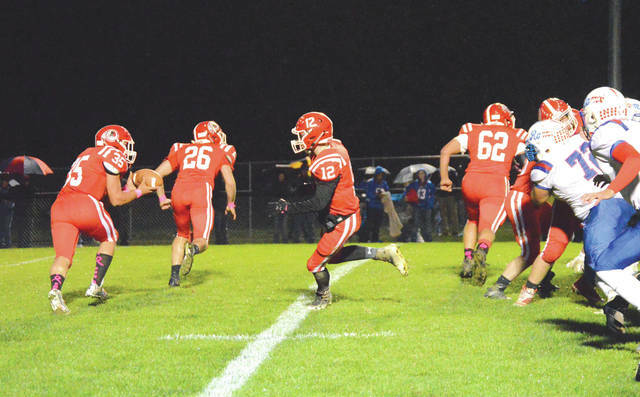 In all, Cedarville fumbled the ball away three times while hanging onto two others, and Greeneview snagged a pair of interceptions as well in the Ohio Heritage Conference South division battle. Unofficially, Greeneview’s Nick Wolfe collected one fumble, and Jaron Stoneburner nabbed two other miscues. Ian Tamplin, Collin Wilson and Devan Hendricks each snared interceptions. While the Rams fumbled the ball twice, the only one they lost came on the opening kickoff. But Cedarville took over the ball on its own 45-yard line and lost it on the very next play. Three plays later, Greeneview had scored from 56 yards out on a Tamplin pass to Taylor Stinson. Jon Brakeall’s kick then made it 7-0, Rams barely a minute and a half into the contest. Greeneview’s Nick Clevenger plunged into the Cedarville end zone barely five minutes later to cap an eight-play drive that started at midfield. Three more plays later, Cedarville’s Hunter Baldwin was picked off and a Greeneview defensive back weaved his way down to the Indians’ 3. Hendricks scored on the next play. Another Brakeall boot then made it 21-0 Greeneview, and the rout was on. With 9:12 to go in the first half, Greeneview scored through the air on a 42-yard pass play from Clevenger to fellow senior Wilson for a 28-0 lead. Clevenger then added to the lead with a 10-yard keeper for a score on the Rams’ next possession. Brakeall even nailed a 45-yard field goal with just over two minutes remaining in the first half to make the score 38-0. Then after Stoneburner fell on his second fumble recovery of the night, Clay Payton scored from 14 yards out on the next play to make it 45-0 Rams at the break. A running clock was kept throughout the second half. Tamplin scored on a six-yard keeper to make it 52-o with 9:22 left in the third quarter. Cedarville got on the scoreboard with 1:42 left in the third quarter. That’s when Brandon Pollock scooted around the right, then tight-roped his way down the Cedarville sideline for an eight-yard score. Pollock then ran in the two-point conversion to make the score 50-8. Greeneview then closed out the game’s scoring on a one-yard quarterback keeper by freshman backup Aidan Swayne. Brakeall connected on five of his six extra-point tries, while freshman kicker Hunter Anderson booted the last two. Despite the slippery conditions, Cedarville sophomore running back Kane Odon rushed for a game-best 74 yards on 14 carries without a fumble, and he recovered one other Indians fumble. Cedarville (1-7, 0-3 OHC) hits the road for its last two games of the regular season. The Indians have a 7 p.m. Oct. 19 date at Greenon next, then will close out the season Oct. 26 at Catholic Central. Friday night’s game was Greeneview’s final road game of the regular season. The Rams (7-1, 3-0 OHC) will play host to Catholic Central for their next contest at 7 p.m. Friday, Oct. 18 at Don Nock Field. They then close out the regular season the following week with an Oct. 26 home game with Madison Plains.